I bake with protein SO often that I can't tell you the last time I made pancakes or waffles that were not some sort of protein creation. Nothing wrong with some protein baking .. but man I forgot how melt in your mouth delish a REAL pancake without any protein added is!!! While I AM NOT a huge pumpkin fan ... there is ONE company that seems to just get it right. I don't know HOW but pretty much ANYTHING from Trader Joe's that is PUMPKIN ... is AMAZING. It's like they have figured out the perfect spice ratio or something. I literally STOCK PILE their Pumpkin Pie Spice and Pumpkin Spice Pumpkin Seeds!! I buy enough every October/November to get me by until NEXT pumpkin season! Well .. now I will add ANOTHER Trader Joe's pumpkin product to my stock pile pantry. 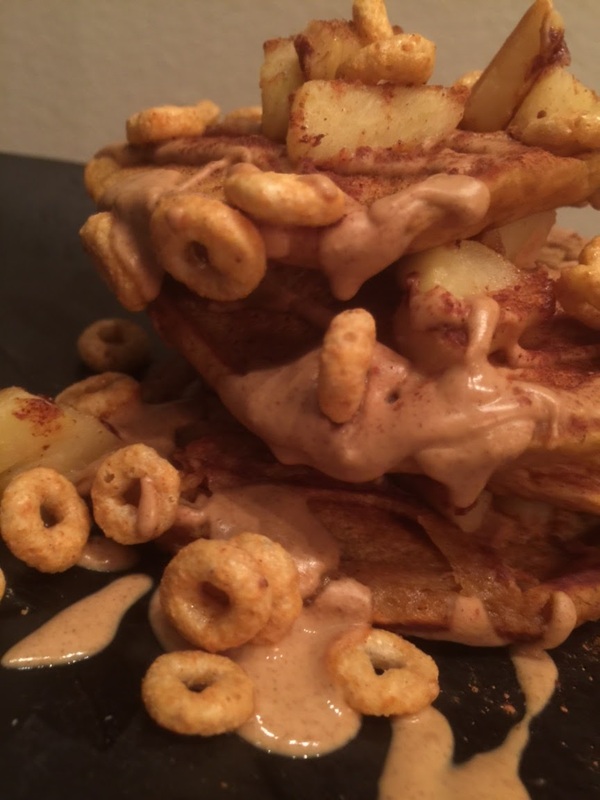 Gluten Free Pumpkin Pancake Mix! They also have a GF Pancake & Waffle Mix. No clue what the difference is .. haven't tried that one. Of course I also had a side of sweet eggs with this stack of glory .... because ya still gotta get in protein at each meal!! I just scrambled up some egg whites and added some cinnamon and stevia. But HERE and HERE are two really great sweet egg recipes! SWEET EGGS ARE LIFE! 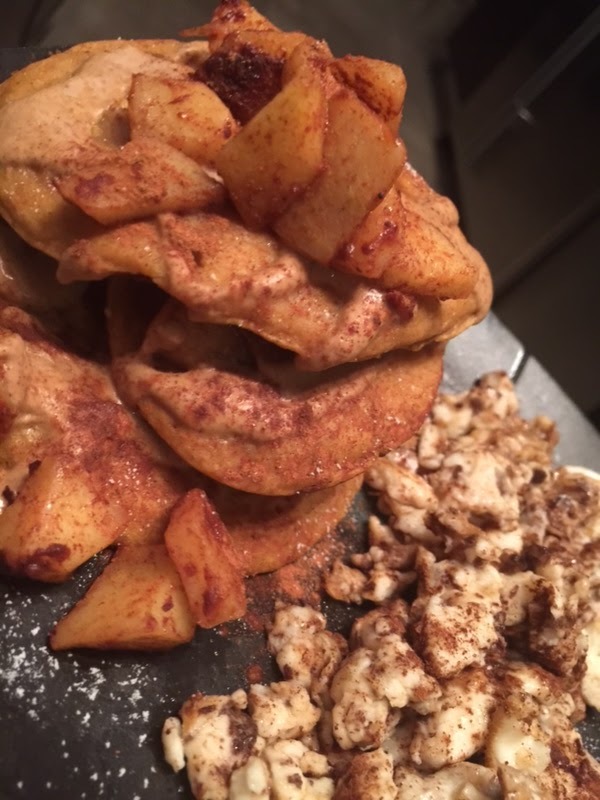 This GF Pumpkin Pancake recipe below is for a SINGLE serving! Adjust the ingredients if you want to make more! I made 2 servings the other day and kept everything pretty much the same. Except I used a LARGE egg white, doubled the applesauce and added 2 more tablespoons of water. Everything else stayed the same and they tasted great! 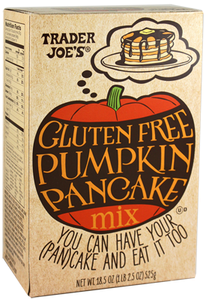 * 1 serving (dry mix) - Trader Joe's GF Pumpkin Spice Pancake Mix outta the box! Then make them as directed! As always when it comes to pancakes .. PATIENCE PAYS OFF. Cook them on medium low so they are nice and golden and soft on the inside! If you turn up the heat because you are dying to dig in (yes I've been guilty many times) .. you will get a crispier and much less fluffy pancake! I topped mine with pan softened apples (with cinnamon and stevia) one day and pan softened banana (the same way) the next day. BOTH were amazing!! Oh and yea that is pumpkin spice cheerios on the ones right here on the right! Currently .. I am kind of obsessed with any flavor of Cheerio's. Head on over to my pic on Instagram and leave me a comment if you make them! Or just comment here on the blog! Nobody ever talks to me on here, haha! SIDE NOTE --- I don't know WHAT THE HECK all that jibber jabber is at the bottom of this blog. But it doesn't matter what I do ... it won't go away?! Any blog/techie experts out there? Let me know! !